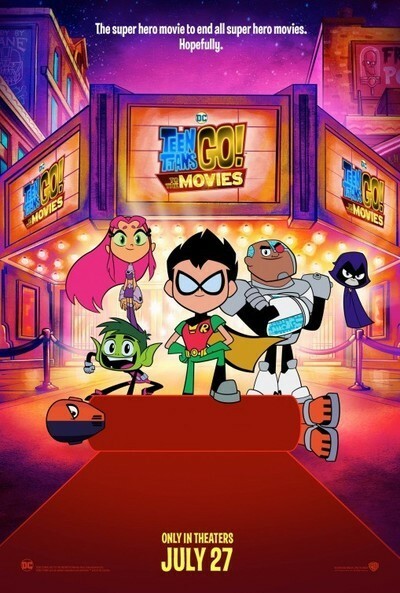 “Teen Titans Go! To the Movies” is so full of references to its own existence and the kind of potty humor that makes kids in elementary school cackle that it could have been called “Deadpoop.” Beast Boy would like that joke. He’s one of the members of the titular group, a quintet of semi-heroes that the real supermen and superwomen refer to as “goofsters.” They’re more likely to break into a musical number explaining who they are than to actually stop the crime unfolding in front of them. Always being the sidekick and never being the superhero has been weighing on the leader of the Teen Titans, Robin. He’s watched everyone else get a superhero movie, and when previews for “Alfred” and “Utility Belt” reveal just how low down the ladder the Boy Wonder is in the eyes of Hollywood, he devises a plan to get his own movie. Based on the hit Cartoon Network show, “Teen Titans Go! To the Movies” is a clever, funny examination of its very existence. Much like how “Deadpool” and “The LEGO Batman Movie” serve as meta commentaries on the superhero genre of films that so dominate the marketplace, this funny flick uses our obsession with men in tights as its comedy backbone. It alternately mocks and embraces our international love of superheroes, resulting a movie that both diehard Comic-Con attendees and those who wouldn’t be caught anywhere near an actual comic book can enjoy. It’s an infectiously goofy film, but also deceptively smart about why we love comic book heroes and the amount of stupidity we’re willing to accept within the genre. Robin knows that in order to get the attention of a famous superhero movie director (voiced by Kristen Bell), the Teen Titans need an arch-nemesis. Enter Slade (voiced by Will Arnett), a bad guy who masters in mental manipulation (like getting you to look behind you or make a pencil look wobbly) and has a name that sounds wicked cool when said slowly, and in a deep voice. Robin convinces the rest of the Teen Titans—which includes Cyborg, Beast Boy, Starfire, and Raven—that battling Slade will get them the cinematic attention they deserve. Although getting a rid of a few of the other attention-grabbing superheroes, including a Man in Steel voiced by the once-cast-as-Superman Nicolas Cage, might help their cause as well. That last plot point leads to one of the funniest montages in superhero movie history as the writers of “Teen Titans Go!” find a way to blend the internationally-known origin stories of characters like Batman and Superman with a spoof of “Back to the Future.” It’s one of many sequences that hits multiple demographic targets. The reason “Teen Titans Go! To the Movies” works as well as it does is because of that balance of high and low brow humor. It’s a clever family film that can alternate jokes at adults and kids in such a way that neither demographic gets bored, and this one pretty much maintains that balance throughout. Some of the bits go on a bit too long, but the film is remarkably well paced, especially for two genres that often wear out their running times (superhero and family films). “Teen Titans Go! To the Movies” might have felt even fresher without the existence of the other meta-comedies that dissect our superhero obsession, but the writers understand that as well, making direct reference to “Deadpool” more than once. It’s not a film designed to break ground or even offer too much social commentary on the role of superheroes in modern culture. It's built with the primary goal of making you laugh and forget your problems for just under 90 minutes, and it does exactly that. When I heard that the show my kids adore was being adapted into a film, I was naturally hesitant that the 11-minute experience on TV could maintain itself for eight times longer on the big screen. Most TV shows buckle under the weight of cinematic expansion. Not this one. The most remarkable accomplishment of “Teen Titans Go! To the Movies” is that a children’s film about how there are too many superhero movies has me hopeful that they make a sequel to this one.